Nice relaxing cruise along Brisbane river to Breakfast Creek and Newstead House - we enjoyed the tour with fresh scones to start and some lovely views on the river. Very enjoyable river trip around Brisbane's waterfront. 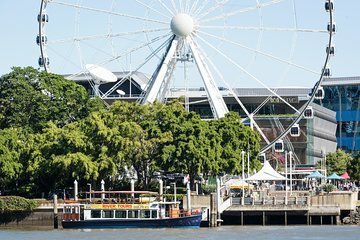 Easy on and off location right in front of the Brisbane wheel near the business district. Captain of the vessel was informative and very entertaining. For an easy day in the city, this was a fun excursion. Brisbane river cruise was enjoyable and relaxing. Weather was fine but a cool wind came through upstream therefore would suggest taking a jumper to keep warm. Blankets were provided on the cruise. Very interesting tour and would recommend to others.